Today was nothing short of a gift. 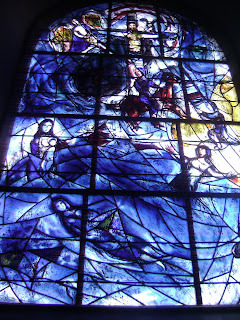 I met my friend Janet at All Saints Church, Tudeley in Kent where there are 12 stained glass windows which were created by Marc Chagall. We were blessed with a crispy, bright day and met in the car park as arranged. The building really is tiny, unassuming and frankly, uninspiring looking but ,stepping through the door revealed a world of sheer beauty and delight. The windows look nothing from the outside - the exterior gives nothing whatsoever away, but, inside the tiny church, the illuminated windows were a sight to behold. The first of them was comissioned by the parents of a local girl who died tragically at the age of 21 and they wanted it to commemorate her young life. They, at the time, lived in the nearby house 'Summerhill' which subsequently became a well known and controversial free school. It was reading a book about the school's founder, when I was a teenager, that inspired me to home school my children for a portion at least of their (my!) education. I can't wax lyrical enough about this wonderful place, but should you ever be in the area, I would definitely recommend you make a visit there. In fact, I'd suggest that, even if not in the area, you go take a look. My pictures cannot possibly do the place justice but I hope they provide a glimpse ... Make sure you take your camera - I was there for half an hour and took over 100 photographs of flagstone floors, bits of chipped wall, lettering, panerls, columns etc - it was a photo opportunity par excellence! I love the signature piece and the way that you captured the light. I also read that Summerhill book way back when as my father was an educator. Sounds like you had an inspiring and glorious artist date. They are fabulous photos.....thank you for telling us about this wonderful place. OH wow, these are so beautiful. thanks for sharing. OH- these windows are truly amazing...I have never seen anything like these...so free-flowing and beautiful! Thanks for sharing! Oh what a fun day you and your friend must have had! These windows are exquisite. I can imagine how long it took to create these works of art. Thanks for sharing the history too. What a glorious moment to share and I thank you!!! Oh I'm jealous!! 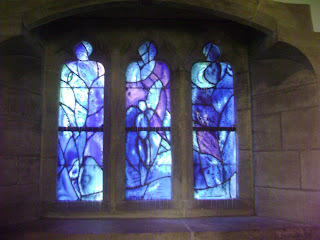 I love stained glass windows and these are fab examples, what an inspiring day out. Beautiful. You captured the mood. Thanks for sharing! gorgeous pictures!!! i absolutely find the art of stained glass windows breathtaking. Thanks for visiting my blog! Aren't you blessed to be able to see these in person. I was looking at them online as I researched for my little Chagall-ish atc. Thanks for the link. Those are beautiful. Thanks for posting them. 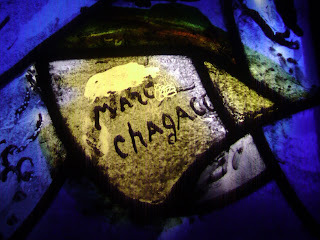 I saw some Chagall windows in southern France in 1986. That is what inspired me to study stained glass. I like making stained glass windows the size of walls - walls of glass.